He.net Review 2019: Is He.net a Good Hosting? Hurricane Electric offers dedicated servers that are perfect for large-scale websites, E-commerce sites, and reseller networks. They aren't the fanciest provider, but they can provide the stability your site needs. 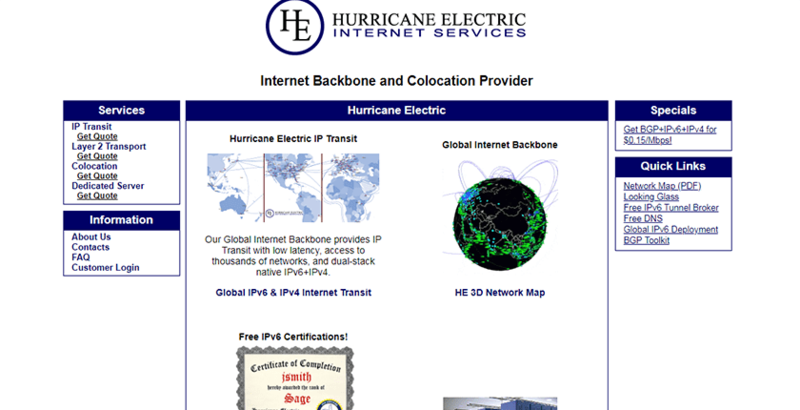 Hurricane Electric Internet Services is a U.S.-based company that offers stable, dedicated server hosting They use a resilient fiber-optic topology with over a dozen 100G redundant paths across the globe along with gigabit connection speeds. They aren’t the fanciest provider around, but they can provide a solid backbone for large-scale websites and hosting networks. Hurricane Electric offers dedicated servers on multiple fiber optic gigabit connections that connect directly to major networks. They offer both battery backups and emergency generators for their servers, meaning your servers should never go offline due to power outages. When you rent a dedicated server from Hurricane Electric, you’ll receive the following features. As you can see, there’s nothing really spectacular about their service. It is more akin to old HP desktop computers. They don’t have much in the way of advanced features, but they will get the job done if you know what you’re doing. Since Hurricane Electric only offers dedicated servers rather than strict hosting services, you must have near-expert knowledge to use their services. Their services are more suited for those running medium to large scale websites or those looking to resell hosting. If you’re looking for to run a small-scale site, you’d be better served to look for robust shared hosting for VPS services from a managed VPS provider. Hurricane Electric offers customizable dedicated servers on a quote based system rather than a flat fee. If you want to use their services, they provide a form for a quote form so you can describe some of what you’re looking for, and they will get back in touch for more details in order to provide a specialized quote. Support works a bit differently for Hurricane Electric. If you’re using a dedicated server, you’re expected to be reasonably competent in most areas of server administration. As such, there is no knowledge base available, and the only form of support offered is 24/7 phone and email support. There are no toll-free phone options. If you’re looking for a simple dedicated server solution, Hurricane Electric can fit your needs. Their servers are for those looking for reliable hosting and aren’t worried about having the bells and whistles offered by other hosts. Wondering how He.net stacks up against other Web Hosting companies? Enter any other Web Hosting company and we will give you a side-by-side comparison.